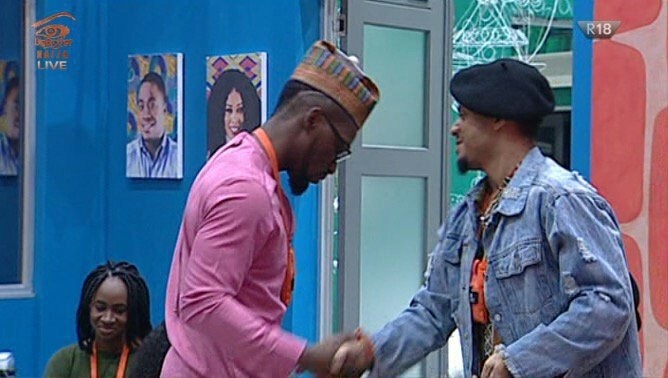 Tobi and Rico Swavey emerge as the winners of #BigBrotherNaija - Double Wahala “Duo Clip” special task sponsored by Nokia. It must really feel good for housemates in the ongoing Big Brother Naija to win some cash while still in the race for the grand prize. Even if they eventually miss out on the 45-million-naira worth of grand prize, the pair of Tobi and Rico Swavey have already earned N2 million, Nokia 8 Bothie phones and shopping vouchers. Thanks to their expression of creativity and story delivery, Tobi and Rico Swavey, emerged as the winners of the “Duo Clip” special task sponsored by Nokia. Housemates were paired two each to present a task titled “Duo Clip” using Nokia 8 to shoot and edit their own unique content. Some of the pairings were; Cee-C and Bambam, Rico Swavey and Tobi, Miracle and Nina. Housemates were to deliver a short film story with the themes; legacy, heritage, durability, endurance, strength, courage, passion, connectivity and togetherness. Each housemate chose a theme and was to work on it with their partner to create a unique content peculiar to the teams. The housemates, headed by the Head of House (HoH), Nina decided to write each theme on different pieces of paper and housemates picked one paper at a time. Each housemate picked at random a paper with a theme. Nina chose 'Love', Lolu chose 'Strength', Anto ‘Legacy’, and Tobi ‘Connectivity’ and so did other housemates pick one theme each. Tobi who served Big Brother’s punishment throughout the week has been forgiven but had to play the game with two strikes just like Cee-C and Lolu.